April 18 , by Mardi Robyn. Siobhán Keogh from Vovs Jewellery Blog shares with us her tutorial for making chevron patterned friendship bracelets. I actually have never made a friendship bracelet, so as someone who is inexperienced with the technique I found her tutorial to be easy to understand and the step-by-step pictures help. This bracelet would be a good afternoon project for teens to do by themselves or with a sibling or group of friends. 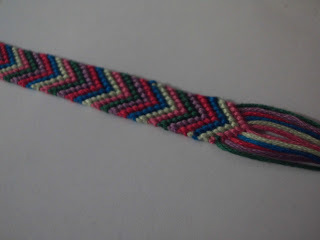 Check out the tutorial and learn how to mak your own Chevron Friendship Bracelet.